Seeds in the Dream That tiny acorn, buried in the ground, tentatively sprouting, filched by squirrels, bombarded by storms, blazing sun, freezing temperatures, high winds, fire, becoming flexible, enduring all as it matures in its natural intended way. Seeding and re-seeding through the seasons. The span of the branches is as wide above as its roots below. I love the symbol of The Tree, recognising the soil as its Mother, with its roots, trunk, branches, leaves, giving and taking, providing shade. It’s like that in the dream … a seed is planted, something shifts. There’s more soul space within for growth, germinating, biding its time. Sometimes there’s a bit of sweet synchronicity when there appears to be no causal connection between two events. The bridge between the collective unconscious and consciousness seems a little less shaky and less narrow. We see the myth of our times a little more clearly, suffused with those inherited ones from aeons past. The collective unconscious is a strata common to us all, where motifs, myths and the archetypes appear everywhere. Somehow we’ve lost touch with our sacred inheritance. I can’t stress enough how the dream is specific to the dreamer. The archetype is impersonal. It just is. It is especially important in this regard to not be led away from the dream, but to focus on the image, the form and content. A symbol is not a sign – a sign tells you this is black or white – symbol goes beyond the obvious and immediate meaning of the dream. Let the image of the symbol continue in it’s shapeshifting. I’m pondering what you said, “Somehow we’ve lost touch with our sacred inheritance.” I have felt this way many times in my lifetime. I can’t explain it but I have always felt like a very old soul. Does that make sense? Perhaps there is a part of me I’ve buried and lost. Thanks again, Susan. This has been an incredible series. Great analogy and guidance, Susan. What a lovely graphic it is! I looked forward to reading this one and finally got here. We Virgos like to do things in the right order, so I didn’t skip ahead. Dreams as seeds feels just right to me. I have a few images stuck in my psyche now–and I’ve probably told you all of them in my responses. They are numinous seeds of a new attitude or perspective, but I don’t get it. So, like snow peas and lettuce seeds, I plant them in fertile inner soil and wait for them to grow. Those seeds can indeed be numinous, as I’ve occasionally discovered and occasionally do – at times I’ve taken up the paint brush, or played with a piece of clay. This is really what dreams are about aren’t they : balancing things out and allowing for a new attitude or perspectives which serves us well. I paraphrased Jung somewhere, past or upcoming post, that the hands often work out what the head cannot do … and planting in rich fertile inner soil and wait for them to grow, trusting/hoping/waiting for them yield their fruits .. Thank you Elaine for coming by, I so appreciate this. Such a beautiful and evocative post–from the striking tree image to your thought-provoking words. “Soul space”– I really like that. I wonder what might grow in such a fantastical garden. Thank you Sara – wondering (and wandering in the soul space) is always worthwhile. I got completely immersed into this, Susan. An experience more than a blog post. Love the S&G song, the image, your words on specific dream to person so well put. Thank you. Thank you Silvia. I so appreciate your comment. As you say, as above, so below. I love the concept of the collective unconsciousness. My sister and I and a group of friends used to sit in a circle and let ourselves slide into a deep meditative state where we tried to tap into that collective unconsciousness. Those were very special evenings, ones I haven’t thought for a long time. Thank you, dear Susan. Thank you dear Kern. Byron’s ‘The Dream’ is vivid and very beautiful. Thank you for taking the time to hunt it down – and bring it up. I will copy and paste it to my inbox; it deserves a re re re reading. I hope others come across it too. How lovely to re-collect your meditation evenings..
After percolating about THE TREE, I wonder if I have new insight: AM I THE TREE? Ha Joseph! Percolating is good …! You had me with the image of the tree. Trees have always fascinated me on many levels..
You made a deeper connection with Simon and Garfunkel, because Paul Simon always taps into my soul. Thank you Shan. I’ll pop along to your post shortly. There is a symbolic and literal extension to my previous comment. Thank you Joseph. Yes, aging does bring with it a diminishment of much in many ways, as well as ‘enlargement’ in other ways. If we haven’t previously given much thought to death this may be he appropriate time to reflect on life and our inevitable death. Slowing down allows for enlargement is my thought ..
Simon and Garfunkel have taken over my consciousness. It’s ok. I love them and I love your post!! It is elevated to the favorites category. I love all of your posts and being a favorite means this is excellent dear friend!!! Mary’s fascination with dead foliage on the top of a tree. I have wondered, botanically, what could account for this. As an untrained botanist, I speculated that nutrients such as water & chemicals from below need to rise against gravity to higher levels, and at higher levels the “water-pressure” and nutrient quality diminishes. Botanically, one could think that dried out branches at the top would absorb moisture and dusts, and parasites, later causing the entire tree to perish. The feeling tone for this is empathic sadness for the tree and a sense of dread. Thank you Joseph for responding with your feeling about the tree. I guess there’s always a danger about spreading one’s self too thin and taking in too much ‘knowledge’ without absorbing it in a healthy way, leading to a deadness at the top. Your reflection of sadness and dread for the tree is meaningful, thank you again. Loved the part about sweet synchronicity… symbols in a dream as seeds… Yes. A whole new world of possibilities. Thank you Jeanie! Just in the last few dreams I’ve been singing, last night in a synagogue, the time before in a cinema … the more I write these posts on dreaming, the more I’m dreaming. It’s fascinating! So pleased you’ve got the song! Hello Darkness my old Friend! Especially because of my love of trees – physical and metaphorical – (and of Simon and Garfunkel’s song! ), this one will stay with me for a while. Lovely post. Love that song, since my college days. I’m fairly linear, but S&G convinced me there was another side to life. Good post, Susan. Thanks Jacqui – S&G was influential in those days – This song still is! Oh goodness Susan, the Hello Darkness reference has really left me vibrating. I’m pretty sure I never consciously made the connection to dreaming – duh!!! I’ll be using the ‘vibrating’ word for V somehow Deborah! Just made a note, thank you! Dreams are seeds for sure! And like seeds they need lots of attention to come to fruition. They are watered by our tears and laughter, fertilized by our experience and the sun of our intention helps them sprout and grow. Thanks for all this lovely writing you’ve been doing on dreams – it is nurturing my dreams these days. Thank you Jan! The more I’m writing on these posts the more my dreams are presenting. There’s got to be a connection. I love how you say about dreams: ‘They are watered by our tears and laughter, fertilized by our experience and the sun of our intention helps them sprout and grow’. Thank you Susan. The interplay of the individual while connected to the outside is a real one. Thank you Genevive. Jung went quite a bit further with the unconscious ..so pleased you loved the image! It does speak doesn’t it. I am really drawn to the tree image and symbolism. I find myself photographing decaying trees. I especially like the ones that are dead on top, but have new growth below. The continuation of life. They’re like the phoenix. That’s one of my favorite S & G songs. I quietly sang it out loud as I read your blog. The Phoenix is a lovely image, rising from the ashes. Thank you Mary. Sometimes we think/feel/believe that something is dead but it’s not, just biding its time. Beautiful, Susan. I have really enjoyed this series so far and especially enjoyed the enlightenment I’ve received. And that’s exactly what dreams are, a vision that is planted in our brains. Great post that truly resonated with me. That’s great Suzy, thank you for coming by. Susan, I spent yesterday out in the yard, cleaning up for our Spring, looking at new growth, trees, seeds, weeds, leaves…. and thinking about the cycle of life. I need to integrate that into my view of dreams. Thank you. That’s a lovely approach to take Beth, thank you. 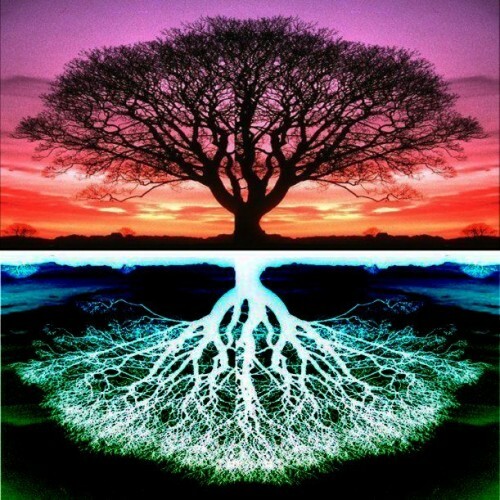 The image of the roots of the tree today does not need to be thought of as SUB-terrain as it is actually a reflection from a single plane of water. The reflection “announces a plane of consciousness” as mentioned here earlier. We are UN-conscious here of anything literally below this plane. Thanks Joseph! The word reflection is especially significant. … A symbol goes beyond the obvious … I like to share my favourite definition of ‘Symbol,’ taken from ‘The Creative Imagination in the Sufism of Ibn ‘Arabi’ by Henry Corbin, translated by Ralph Manheim, Bollingen Series XCI, Princeton University. Thanks Ashen so much for the quotation which expresses symbolism so clearly and its analogy with a musical score. I’m going to copy send and paste it to my inbox. I love your image of the tree! Showing Crown as well as Roots is also significant. Lots of Symbolism here, maybe the Conscious & Subconscious? The Tree Image has been used as a projective test in Psychology, well used with children and adolescents…asking the child first to draw any tree he/she likes, then what she would name different parts of the tree, etc., and imagining where is the tree is located, by itself or among other trees, other trees as siblings maybe, etc. Thanks Joseph for your comment. Conscious and UNconscious yes (the unconscious is the preferable word – somehow sub has become mainstream) although the unconscious has far deeper ‘roots’ in reality. Thanks also for the reminder about the Tree used a projective measure which reminds me of an art class some years back where we as adults drew a tree, and discussed the symbolism of it. A really great explanation of dreams and I love your tree.